This is not just any ambergris, it is fossilized ambergris. The rare substance – prized by perfumers – comes from the intestinal tract of sperm whales and is expelled either through the mouth or the other end. 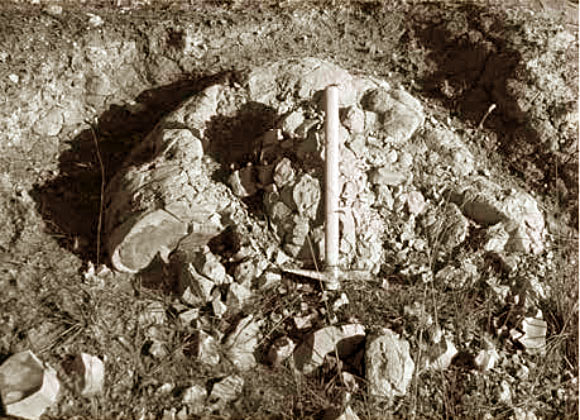 When Italian scientist Paola Sassi and his colleagues at the University of Perugia found more than 25 large cone-shaped structures emerging from the sediment at the Allerona site in western Umbria, which is known for its high concentration of sperm whale coprolites, they examined them in more detail. They measured 30-60 cm high and 60-120 cm wide with a color that varied from yellowish red to light gray. The form and striation of the deposits resembled ambergris and their chemical content matched mammalian gastric activity. But what clinched the discovery was the presence of partially-digested fossil squid beaks. “The discovery of these masses of ambergris increases our knowledge of the distribution and activity of sperm whales in the ancient Tyrrhenian Sea 1.75 million years ago,” write the authors of the first documentation of fossilized sperm whale ambergris anywhere in the world.